The Lenovo C40 AiO is a budget-friendly all-in-one PC that makes efficient use of space while delivering superb performance. Known formally as the Lenovo C40 All-in-One, the machine flaunts an attractive design and packs a massive display, powerful processor, ample memory and optional discrete graphics making it perfect for both work and play. Featuring a space-saving design, the Lenovo C40 AiO has conspicuous bezels around its sides and a slim but durable V-shaped stand for solid support. It has a glossy finish on the front and is available in two colours. Lenovo C40 is accompanied by an AccuType Wireless Keyboard with island-style, ergonomic keys for smooth typing experience. The all-in-one PC crams in a huge 21.5-inch display, which is available in both touch and non-touch variants. The LED-backlit screen boasts Full HD (1080p) resolution and optional 10-point multi-touch support for improved touch experience on Windows. 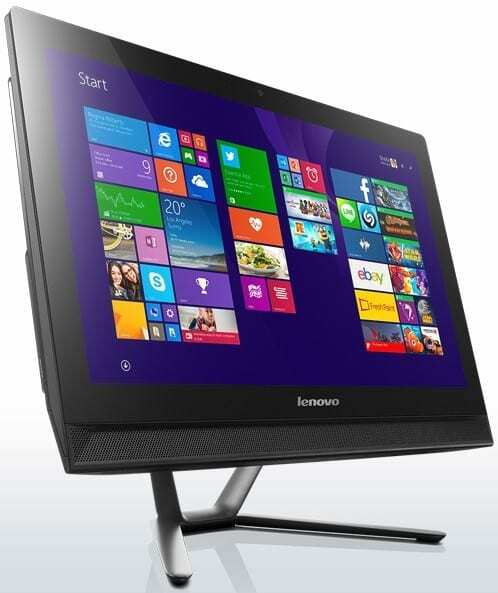 Lenovo C40 AiO is armed with an AMD or a 5th-generation Intel Core (up to Core i5) processor. Performance is supported by generous RAM of up to 8 GB. The computer is obviously configured to deliver solid performance. You may opt to have discrete graphics card with ample 2GB of memory on your own unit at extra price to enable you use more demanding applications and play many modern games. With two USB 3.0 ports on board, you get to enjoy superb data transfer speed that is up to 10 times faster than earlier USB technologies. You also get three USB 2.0 ports, a LAN port and an impressive 6-in-1 card reader. Lenovo C40 AiO has HDMI-in and HDMI-out ports. 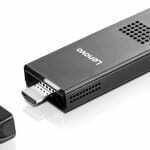 The optional HDMI-in port allows you transform the PC to a standalone display, just like a TV, for watching movies or playing games on external devices. Lenovo C40 AiO is engineered to pump out rich sound through a pair of integrated stereo speakers (3W) backed by Dolby Advanced Audio technology. You get ample storage memory of up to 2 TB for storing all your important files. 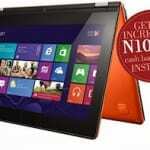 Lenovo C40 all in on PC runs on Windows 8.1 operating system and features an HD (720p) camera with mic. It comes with 802.11 b/g/n for wireless connectivity. 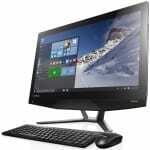 Lenovo C40 AiO desktop is not yet available in Nigeria. Lenovo C40 price in Nigeria is expected to start at around N120,000, depending on your location and the configuration of the desktop.